February/March 2013 issue of Quilting Arts, Page 80. Check out the ATCs! You'll see one of mine. 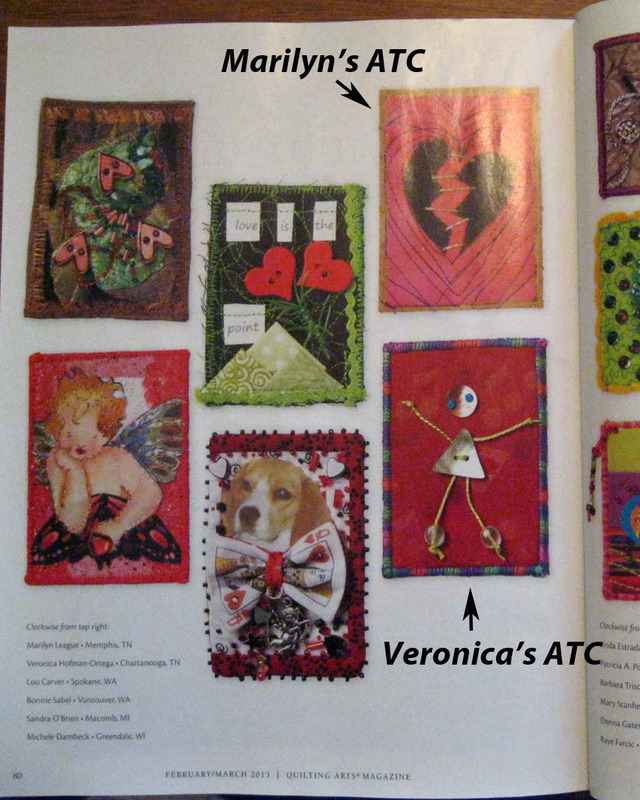 in the February/March 2013 Quilting Arts magazine. 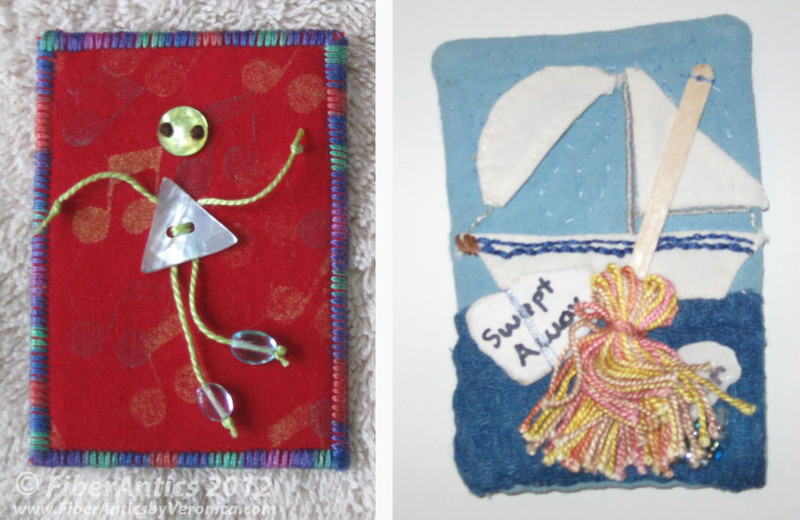 My September 2012 FiberAntics ATC swap theme coincided with a Quilting Arts Artist Trading Cards (ATC) Call for Entries. Some of my traders also submitted ATCs to the magazine and so far, two of us have been published, Marilyn League [Memphis, TN] and me. I don't have my copy of the magazine yet, so I've borrowed this pic from Marilyn's blog. Thanks for the nice write-up on the FiberAntics ATC swaps, Marilyn. I also received this ATC jewel in trade from Ruth Lenardozzi for participating in the QA ATC swap. Left: My "What's in Your Heart" ATC. Right: "Swept Away" by Ruth Lenardozzi. I'm celebrating my good fortune for having my ATC published with a glass of Bully Hill Banty Red to accompany my Chicken Spaghattini Con Crudo dinner from Tony's. I'm sipping the wine from a souvy mug from my grad school roommie, Patty. We roomed together in Rochester, NY, not far from the Finger Lakes region and Bully Hill winery. By the way, in addition to being a fab vintner, Walter S. Taylor, of Bully Hill, is an artist in his own right. He paints, draws and designs the labels for his wines. It's all so very apropos. Prosit! 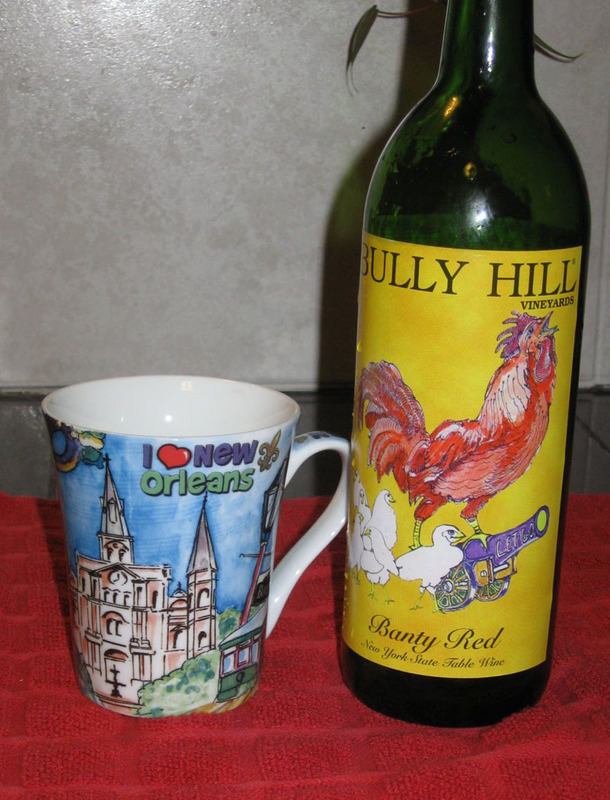 Artistically painted souvenir mug beside a bottle of Bully Hill wine. Walter S. Taylor paints, draws and designs the labels for his Bully Hill wines.